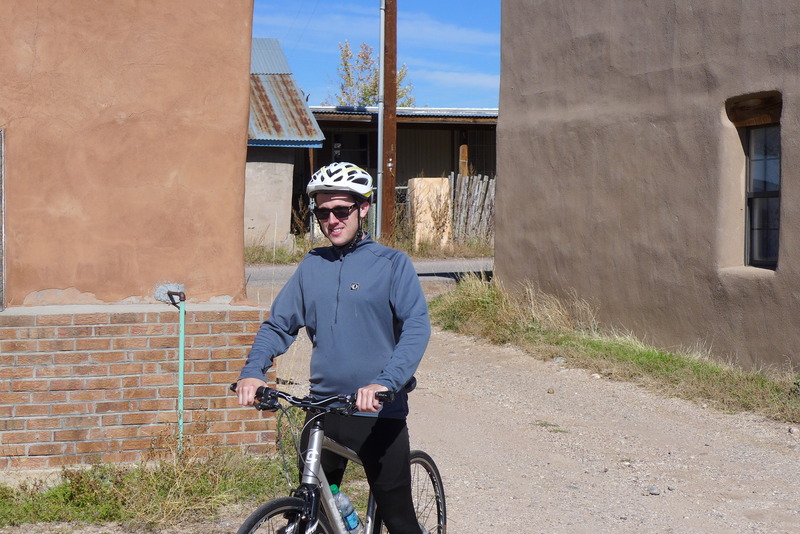 I have family roots in Lubbock, Texas and I went out there to explore them by bicycle. My buddy Lyman graciously agreed to accompany me. Lubbock (population 252,000) is at the center of a huge plain, hundreds of miles wide through the northern panhandle of Texas, spilling over into New Mexico I always thought this high plain was called the Caprock, but I learn now that the more correct term is Llano Estacado. 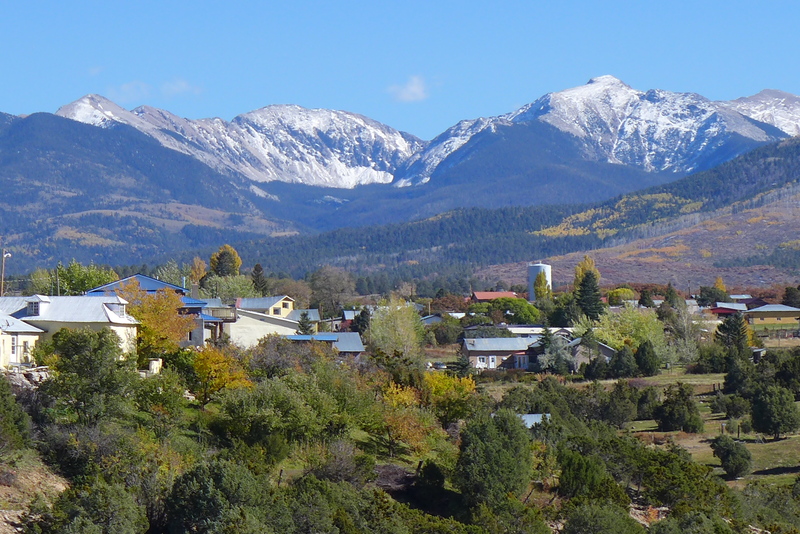 My readers will remember me last year going to the mountains of North Carolina and the town of Boone, which at 3200 feet has the highest elevation of any sizable city in the Eastern U.S., Lubbock on the Llano Estacado sits at more or the same elevation, 3200 feet. But there are no mountains; it is a treeless flat landscape extending in all directions as far as the eye can see. In a few places such as Ransom Canyon in the eastern suburbs of Lubbock there are essentially inverted hills, deep crevices in the flatness. In the last hundred years the Lubbock area has prospered partly because these plains take well to cotton farming, irrigated by unsustainably tapping subterranean aquifers. And of course, Lubbock is the home of the huge Texas Tech University with its 37,000 students. Unlike many other parts of Texas, the area around Lubbock is NOT particularly rich in petroleum. Lubbock is indeed isolated. Except for Amarillo 120 miles to the north and Midland 120 miles to the south, the closest major city is Fort Worth, 300 miles away. Despite its isolation, or maybe because of it, Lubbock has always thought of itself as a higher place, somewhere where education matters, a city that has always had its own symphony orchestra, somewhere the locals felt was superior to, say, Amarillo and Abilene. There are a bunch of famous artists and musicians from Lubbock, and not just Buddy Holly. My grandfather A.C. Jackson was born in 1894, by family lore in a sod house, near the town of Stratford, Texas, two hundred miles north of Lubbock but on similar flat plains. After being raised as one of eight children by his widowed schoolteacher mother he worked as a cowboy for a while. (As an old man he still had his spurs in a box in his basement.) He was drafted into the army and went to France for World War One. Lubbock was just becoming a city when he moved there in about 1923 to take a job at a bank. With him was his new wife Mildred, my grandmother, who had grown up in Kansas City. A.C. Jackson went on to be the business manager for the Lubbock school district and to be an important enough citizen that they named an elementary school after him. He had not been able to go to college but he made damn sure all three of his children did, mostly at Texas Tech, which was right down the street from their house. My mother Eleanor Jackson (Marshall) was born in Lubbock in 1925, the second of three children. She later went to graduate school at the University of Texas, where she met my father, and by 1957 they had permanently settled in his hometown of Norfolk/Virginia Beach. Her brother Joe Terry moved to California, the San Francisco area, soon after coming home from World War II. Their sister Barbara stayed in Lubbock, raised two wonderful daughters and was a schoolteacher. On her retirement she moved to Florida, just after the two daughters graduated from college and moved away also. By the early 1980’s no one from our family lived in Lubbock anymore. I grew up in Virginia Beach, but almost every summer during the 1960’s my mother transported me and my three siblings over a thousand miles, usually by train, from the ocean beach to these high dusty plains, to visit our grandparents and cousins. 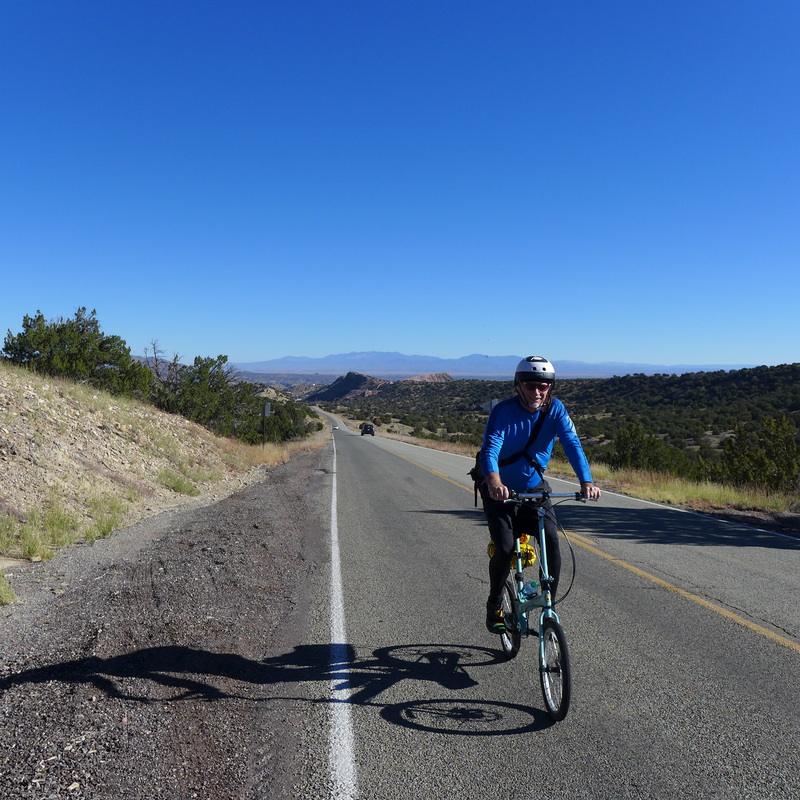 For this bicycle trip through Lubbock, my friend Lyman and I got into his car in Austin, Texas on a recent Monday morning and pointed it northwest towards Lubbock. We drove six hours and about four hundred miles, deciding to stop at the tiny settlement of New Home, Texas, about thirty miles south of Lubbock. We found a parking lot of an elementary school where we felt safe leaving his Prius for a few days. We pulled our bicycles out of the back and started biking north in the direction of Lubbock at about four in the afternoon. Lyman headed out first. There is a lot of space out here and the roads pretty much all go in perfectly straight lines. Very soon out of town we started to see evidence of Lubbock sprawl, new housing being built out here on the flat farmland, over twenty miles from downtown Lubbock, sprouting up like weeds. Gradually we got more into the suburbia of Lubbock. I remembered Lubbock as being a city with nice public services, like parks. I experienced a flashback when we bicycled by Clapp Park, a huge public swimming pool that I remembered visiting with my family as a child. Even within the city, roads are straight and flat. Lubbock is of course laid out in a grid, with the streets numbered and the cross avenues going by letters of the alphabet. Closer to downtown, fronting the major thoroughfare 19th Street this is not a church but Lubbock High School. Famous graduates include Buddy Holly, Natalie Maines (lead singer of the Dixie Chicks), Mac Davis, and my mother, valedictorian of the class of 1942. 2113 – 16th Street, three bedrooms, one bath. My mother grew up in this house. My grandparents lived here from 1934 until they died in 1974, six months apart from each other. My hunch is that the neighborhood had gone pretty far downhill but is on its way back up again. There is new construction going on down the street. With intact 1920’s bungalows and only a couple blocks from the University I am surprised that it is not currently more fashionable. My relatives have commented from this picture that they are disappointed at the lack of shrubbery by the current owners. Unlike Virginia, summer nights in Lubbock were somewhat refreshing; I remember sitting outside on that front porch with my grandparents, aunt, and cousins. Lyman and I spent the night in the downtown La Quinta motel on Avenue Q. Avenue Q apparently used to be a primary shopping street, but now had very little car traffic and a lot of empty storefronts. There was this impressively intact modernist apartment building, fronting a park. Two guys were standing out front, smoking. Later on, in the dark we biked from the motel about twenty blocks out Avenue Q to Orlando’s Italian Restaurant. This is a good restaurant. Eggplant parmesan had lots of cheese and tomato sauce, Chianti was only $ 18.50 a bottle. Foreshadowing the much more overt religiosity that we were to see in the restaurants of small towns outside of Lubbock, near Orlando’s checkout counter was a small stand “New Testament, Take One”. We had to decide where to bicycle the next day. Wind is a big deal out here, especially in the spring and especially when one is riding a bicycle. Clear skies and strong winds 25 – 40 mph were predicted from the southwest. Clearly, we could bicycle only in one direction. The wind was predicted to shift to the opposite direction the following day. We made a plan to bicycle north fifty miles to Plainview and take measure of our situation after that. First we had to see downtown Lubbock. I found it disappointing as an urban space. My theory is that since it was laid out mostly after the invention of the automobile, streets were made extra wide. It lacks the intimacy of an older downtown. Many buildings were empty or underutilized. On a weekday morning there was not much traffic. Mackenzie Park is Lubbock’s Central Park, although it is on the northeast side of town. I was impressed that it included a city-owned amusement park. Prairie Dog Town is a plot of land in the park for the endangered squirrel size animal that lives in holes in the prairie. It was nice cycling through Mackenzie Park, and yes, that was the right direction but the town of Plainview was still almost fifty miles further. To avoid bicycling on the main highway we would not pass through a town the entire way, just miles of arrow straight roads across the prairie. For many years I have been a fan of James McMurtry’s song Levelland. He says he wrote the song for the writer Max Crawford who was from the town of Floydada, thirty miles northeast of Lubbock. McMurtry used instead the name of the town Levelland, thirty miles west of Lubbock, because Levelland sounded better. Lyman and I played this song in the car on the way up here, and while cycling across the vast stretches I could not get the song out of my head. We had run out of water, Lyman stopped and asked this woman to fill up our bottles. A couple of times we just stopped in the middle of the road, just to take in the vastness of it all. About ten miles south of Plainview Lyman decided he just had to have a rest. Shade is a rare commodity out here and he took advantage of this one little tree. 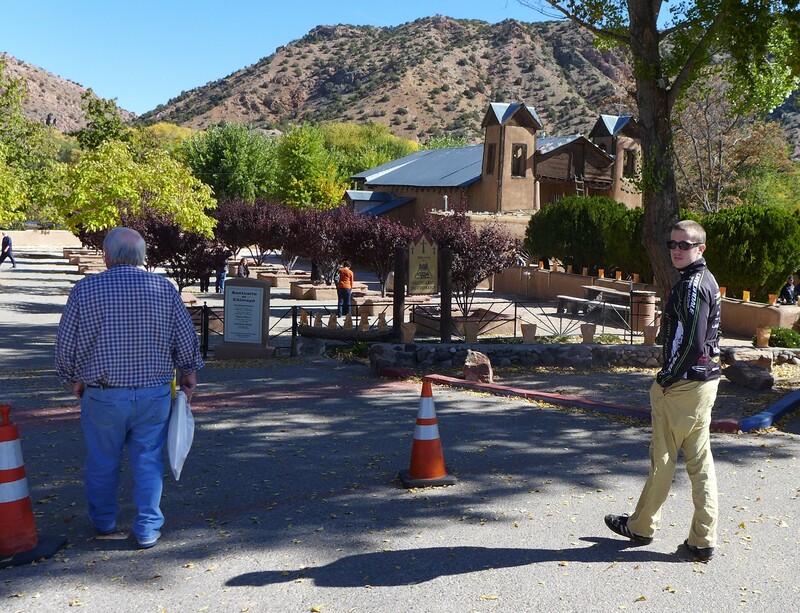 We pulled into Plainview (population 22,000) after two in the afternoon. It was just in time for the local cafe to have stopped serving lunch. The single restaurant we could find open was the chain drive-in Sonic, which would have been fine except that the only place to eat was in your car, which we did not have, or a picnic table outside in the intense dry wind. We got cheeseburgers and toughed it out. Next door to the Sonic was this former gas station right out of The Jetsons. It is now a check-cashing joint. The Warrick Plaza Inn is actually in downtown Plainview, unlike the other motels in Plainview which are out by the Interstate and the Walmart. It was run by an Indian-American family named Patel. They rented us a room for fifty dollars plus tax. While we had expected Western cowboy gear in Plainview, while we were checking in three of the family walked out to their car, dressed to the nines in Indian saris. 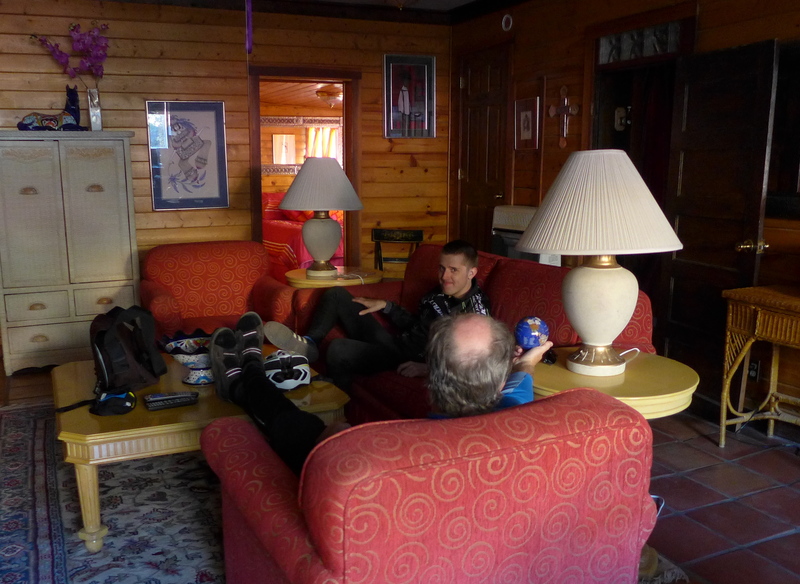 We chilled in the room for a few hours before going out to look for dinner and a beer. We certainly had not ridden all this way to abstain from alcohol. Looking at the usual restaurant websites we could only find one place in Plainview that seemed to serve beer. It was a mile and a half from downtown. We rode there on the bicycles through residential neighborhoods. There must have been a time when Plainview was a prosperous place. The Salt N Pepper sat in a dusty parking lot surrounded by pickup trucks, on a highway across from a factory. At least in my part of the country, it looked like the kind of bar that you go into looking to get into a fight. The door had all these threatening advisories. But we had come all this way, so what the heck. Once inside, it could not have been friendlier. There were only about ten people in there, including one older couple that could have been part of mine and my wife’s circle of friends. We had a nice chit-chat. And the food was good! I got their “healthy” option, chicken and vegetable stir-fry with Asian noodles. The Latina-looking woman in the back doing the cooking turned out to be the owner. The next morning we walked around the empty storefronts of downtown Plainview. Of the very small number of businesses in downtown Plainview that appear to be operating successfully the most prominent is Broadway Brew Coffeehouse. In the cultural environment here maybe a coffee house is a place everyone can agree on. This space has been a restaurant or coffee house for a long time. In the back, near the rest rooms, they had pictures on the wall. This same building, from the 1940’s; the woman in the middle has an amazing expression. We walked back to our motel room and packed up. The wind had indeed changed directions. With a 25 -40 mph wind from the north we now had no choice other than bicycle fifty miles back to Lubbock! We wheeled out of Plainview. Before long we were back on a highway cutting through the almost vacant plains. On reading blogs from from the Lubbock cycling community there was a lot of praise for cycling on the Interstate access roads. That sounds unattractive to an outsider but is actually quite nice, at least in this part of Texas. On the access road of I-27 we had the road to ourselves; sometimes we would cycle for half an hour without a car passing us. We just had to look over at the Interstate highway traffic a few hundred yards away. The wind was delightful, we barely had to pedal it was blowing so hard to our backs. Unlike the day before this route did pass through several small towns. In the dusty settlement of Hale Center (population 2200) there was this nice modernist town hall. From Wikipedia I learn that central Hale Center was totally destroyed by a tornado in 1965. Maybe they put the insurance money to good use. One town further south was Abernathy (population 2800). We had lunch at Another Slice of Heaven Cafe. There were almost all pickups in the parking lot. Inside, colorful exhortations about Jesus were everywhere, I mean everywhere. The service was friendly and efficient. We split the Special of the Day; hamburger steak with mashed potatoes and mushroom gravy with two sides and Texas Toast $ 8.99; it was perfect. We met the owner in the parking lot after lunch, a really nice guy. On the south side of Abernathy we biked past this pleasantly -unaltered 1960’s bank building. There was twenty miles further to cycle into Lubbock, where we had one more pilgrimage to make. A.C. Jackson Elementary, named after my grandfather, sits on the north side of Lubbock in a working class neighborhood surrounded on three sides by freeways. Built in 1949, it exudes proud Modernism and appeared very well maintained. We still had time to bike over for a beer in the Depot District, former warehouses that have become restaurants and nightclubs. The District includes the statue of Buddy Holly. The next morning, pretty much against the wind, we had to bike back to the car in the tiny town of New Home. As I walked out of our motel room, I felt like I had run into some Buddy Holly loading up his car. Lubbock sprawls most significantly on the south side; they just keep adding street numbers. There are houses as far out as about 140th street. Somewhere in sixties I admired this piece of modernism. There are indeed neighborhoods of tract mansions on the south side, this one was at about 110th street. This was much further out, where the development starts to cut into the prairie. Small Texas crossroads still have independent restaurants! Before driving four hundred miles back to Austin, across from an abandoned gas station in New Home we had lunch at The Spot, named after the mascot for their high school football team. Yes, there were religious statements all over the interior. As most of my readers know, I do a lot of solo bicycling trips. I have also done some with my friend Lyman. This trip would be even more more social; it would give me the chance to hang out with some of my oldest and best friends. Tom Constantine, Lyman Labry, Jorgen Jorgensen, and myself all knew each other and lived in New Orleans in the early 1980’s. None of us live there anymore, although we all like to visit. We met on a Thursday morning at Lyman and his partner Gillian’s Austin, Texas home. Befitting a trip in Texas, Jorgen showed up from his home in the Houston Heights with a huge four-door pickup truck. We could easily pile all four bicycles in the back. In this Austin neighborhood, Beto signs were everywhere. We drove southwest about eighty miles to a spot called Devil’s Backbone. 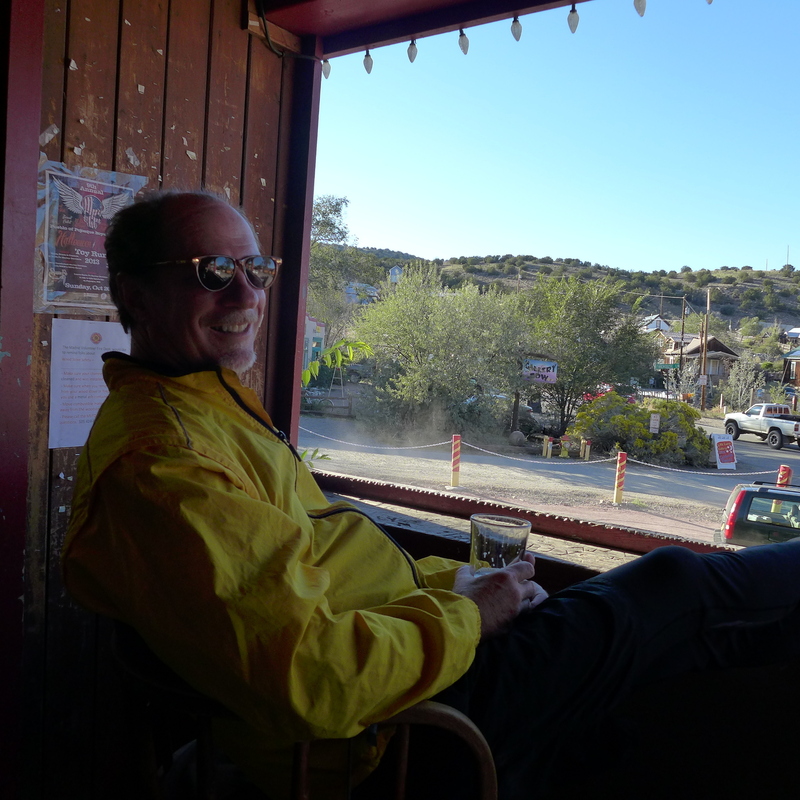 I do not know any parallel in the Eastern USA to the Texas and Western tradition of a bar sitting uniquely and somewhat forlornly by itself on a two lane highway, far from any town. I guess you could call it a roadhouse. This watering hole, named after the rock formation it sits on, has been here since the 1940’s and had a big Texas flag. We had chosen this place to leave the truck to begin our bicycle trip. The bar had several outbuildings and a big yard, and the nice young bartender insisted on giving us a tour. She kindly agreed to keep an eye on Jorgen’s truck for a few days and snapped our photo before we set off. Our destination for the day would be New Braunfels, thirty something miles to the southwest. The first part of the ride was on a busy two lane highway, but at least in Texas there are big shoulders on many of the roads. We got off the main highway on a smaller road that circled a dam of the Guadalupe River. The fifteen miles of River Road north of New Braunfels is a beautiful bike ride, almost flat as it follows the Guadalupe River, with very little car traffic. River Road is indeed full of tourist stuff, for the tubing business during the summer. 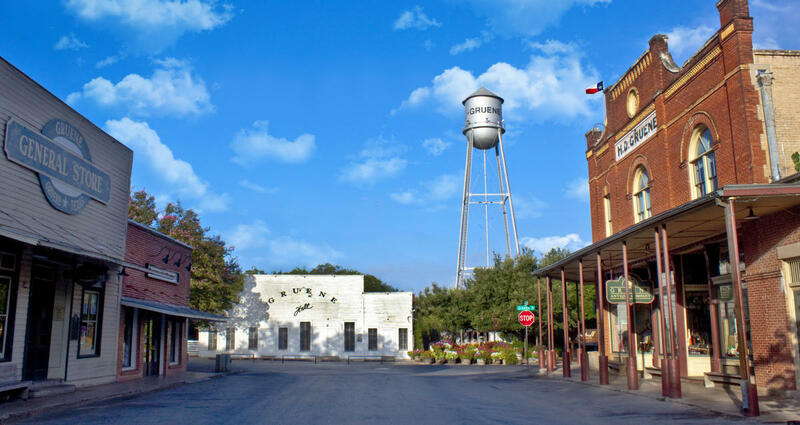 We stayed that night in Gruene (pronounced “green”, we learned), a restored mill town on the outskirts of New Braunfels. Previously abandoned to the point of being a ghost town, it now is quite touristy. Negotiated on the spot, we got one of the better hotel room deals I have seen in a while, four rooms for about the price of two. Surprised that we did not have to deal with roommates, we all slept soundly that night. We again took off the next morning. We rode back along the Guadalupe River, then turned northward on something called Purgatory Road. Although it was mostly uphill, it made us feel like we were really in The West, with big sky vistas. We had had some ideas about biking all the way to the town of Blanco, but decided instead to bike back to the truck and drive the fifteen miles to Blanco. There were noises in our group about wanting barbecue for a late lunch. Old 300 in Blanco filled the bill. The arguments about North Carolina vs Texas barbecue are pointless because the barbecue in Texas is really a completely different dish. Texas barbecue is very up-front in its embrace of large amounts of delicious fatty meat. This $ 7.50 sandwich of barbecue beef brisket seems representative of that philosophy. We spent the night at a motel in Blanco and had the opportunity to bike to a park in central Blanco and see some live music. The jazz band was professional and tight, the Japanese drummer fetching. The central part of Texas, the Hill Country, is clearly becoming a tourist destination. I am reminded that the populations of Fort Worth, Dallas, San Antonio, Austin, and Houston have all exploded in the past decades. All of these cities are within an easy drive to the Texas Hill Country. As bicyclists we ran into other visitors almost everywhere we went. Tossing aside whatever advance plans we had made, the next day we drove the truck and the bicycles to another country roadhouse called Harry’s, about twenty miles north of Fredericksburg. From there we could do as a day trip the somewhat famous Texas bike ride called the Willow City Loop. At eleven o’clock on a spring Saturday morning there was almost no one around Harry’s but the live music had already begun, playing to Harry’s empty picnic area. The ATM on the far right is non-operational, shot full of bullet holes. The guitar player told us that Harry’s expected “150 bikers” (i.e. motorcyclists) to converge here in the next few hours. Jorgen parked his pickup in the yard and we unloaded the bicycles. The bike ride was beautiful. The first two-thirds is on a semi-private road, the only traffic obstacle was other bicyclists and the occasional car. The final part of the bike ride was along a lightly traveled highway, mostly uphill, which seemed to be a struggle. We got back to Harry’s about three hours after we had left it. I doubt there were 150 motorcyclists, but a lot had gathered there. The atmosphere seemed friendly and the new set of musicians were actually quite good, guitar and ukulele. We stuck around for a beer. That pretty much was the end of the bicycling on this trip. That afternoon we piled the bicycles in the truck and drove about forty miles north, just to be able to eat at the fabled barbecue restaurant Cooper’s in the town of Llano. Even though we arrived at what normally (to me) would be a “dead” hour, 4:00 PM, it was still packed on a Saturday afternoon. The restaurant is on the main highway going out of town, the lot was jammed with mostly pickup trucks. To be able to enter a patron first passes by a grill covered with several kinds of meat, where you can select your slab, paid for by the pound. The tables inside had unlimited sides of Sunbeam style white bread and ranch beans. It was all quite delicious, although I was not in much in the mood for meat for quite a few days after this. Eating large amounts of meat is somehow patriotic. Pictures of visits by governors George W.Bush and Ricky Perry were on the wall, as well as a positive review by the intensely conservative newspaper Washington Times.